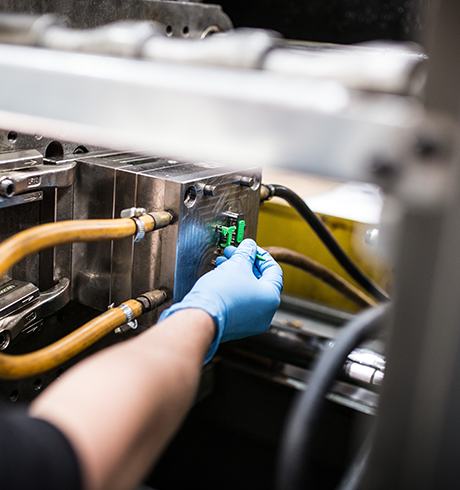 With capabilities that enable us to cater to a wide range of market sectors and a knowledgeable and experienced team of engineers, we can make sure your product gets to market as quickly and efficiently as possible. Whether that product is a car part, medical syringe or bottle cap our specialism in plastic injection moulding – a process which involves melting plastic down to a liquid form before forcing it into a mould cavity, is what allows us the ability to offer a full turn-key solution to your plastic manufacturing needs. 1. Clamping – Pressure is applied to the mould tool from the injection moulding machine prior to plastic injection and cooling processes. 2. Injection – Melted plastic is fed through into the mould in order to create the product. 3. Dwelling – In order for the melted plastic to effectively fill each of the cavities, dwelling refers to a pause in the process which allows this to happen. 4. Cooling – Once solid in the mould the product is given time to cool before being ejected from the moulding machine. 5. Mould Opening & Ejection – Once complete the product is then released from the moulding machine where it can be packed or move onto a post mould operation process. Our years of experience have seen us deliver a vast range of products in varying volumes. With capabilities to provide both low volume injection moulding and high volume injection moulding, the Omega Plastics team has the skills, knowledge and experience to deliver exactly what you need, whether that be 10 or 100,000 plastic components. To find out more about our volume capabilities and plastic injection moulding services, simply use our online enquiry form to get in touch today.